WHAT IS JUNIOR TEAM TENNIS? USTA Junior Team Tennis brings together boys and girls, ages 6 to 18, to play singles, doubles and mixed doubles against other coed teams. There are multiple levels within an age group including beginner, intermediate and advanced. This allows the kids to participate in real match play even while they are still learning how to score, where to stand, and developing their skills. In Junior Team Tennis, the club pros and parent volunteers are allowed to be involved as a court monitor for the beginner divisions. Beyond being fun and a great form of exercise, Junior Team Tennis is a competitive, level-based environment that promotes individual growth, social growth and life skills. 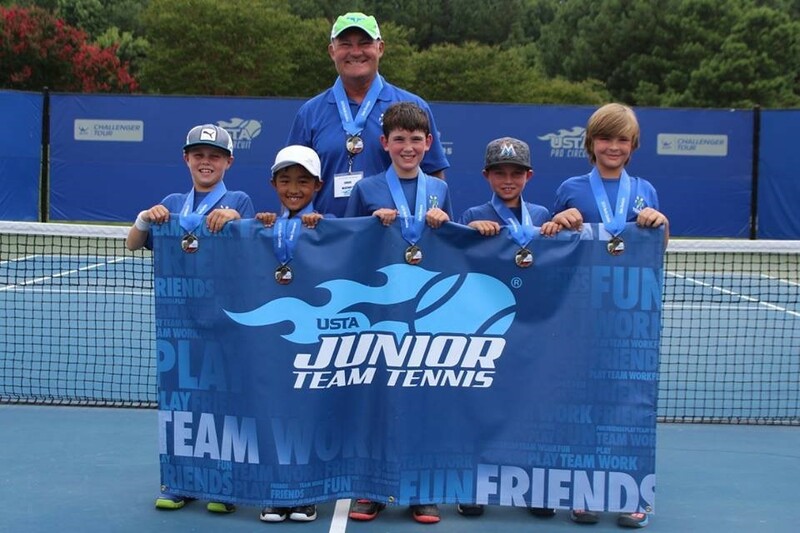 Junior Team Tennis is a Team Event and in the Spring the winners of each local (Charlotte) division are eligible for advancement to the North Carolina State Tournament. THE 2019 STATE TOURNAMENT IS JULY 12-14 IN WILMINGTON, NC. Further advancement to Sectionals and Nationals are only available for “advancing” teams which have additional team requirements in order to classify as “advancing”. There is no State Championship for the fall season. WHAT ARE THE ADVANCEMENT OPPORTUNITIES? Junior Team Tennis is a Team Event and in the Spring the winners of each local (Charlotte) division are eligible for advancement to the North Carolina State Tournament. Further advancement to Sectionals and Nationals are only available for “advancing” teams which have additional team requirements in order to classify as “advancing”. There is no State Championship for the fall season. WHAT IS THE COST OF JUNIOR TEAM TENNIS? $20 - for a USTA membership, if your child does not already have one. Children ages 10 and under may take advantage of the First Year FREE USTA Membership offer. $22 – for the local “league fee”. These fees do not cover the cost of Team Practices. Players on the team are encouraged to come to weekday clinics. Click here for more information on the 2019 Spring Session. The season is from March 17 to mid-May. Teams play every Sunday at either 1:00, 2:00 or 3:00, depending on the division. Typically, there are 8-9 matches in a season. The matches are held at FERSC and other clubs around Charlotte. Your son/daughter may not play every Sunday, depending on the size of the team. Each match consists of 3 singles and 1 doubles match. A minimum of 7 players is required per team. Your child must remain at the age of the division through August 31st of this year. If your child has a birthday before August 31st, they must play up in an older division (i.e., if you are 8 years old and turn 9 on May 1st you should play on a 10 and under team).